See scan - perfect condition. This is a nice Soviet Russian / USSR order of the Patriotic War 3rd Class star badge numbered 4643682 at reverse. 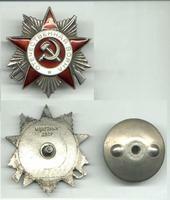 Nice militaria / military collector piece and one of the nice Russian orders.